DaveCon is a small convention in Okemos, Michigan that is associated with the Lansing Board Gamers. I moved away from the area for grad school but am still close enough to make a weekend trip back to visit my parents and game with my friend Matt and his friends! I showed up Friday evening and my friend Matt and all his friends weren't too far into a game of Seasons. I chatted and caught up for awhile until our friend Noah showed up. He mentioned an interest in Escape when he had looked over all the games I brought and since the game of Seasons wasn't about to end, I figured I had time to teach him and play a couple of games. I own all the expansions, but didn't use any for our first game. We just played with five extra gems than the rules say for the 2p game because I usually find the plain base game way too easy, even with the extra gems. Sure enough, we escaped with plenty of time to spare. After that, we had to play another game and played under the exact same conditions as that game. This time the dice and tiles weren't so friendly. I didn't even come close to getting back to the entrance for one of the gongs as I was utterly incapable of rolling a key. The chalice came out really close to the entrance so we were forced to lug it around a good distance. 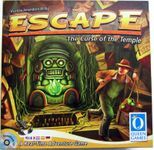 Those and our curses building up and hindering our play greatly had us trying to find the exit when the final gong sounded and needing to roll four keys to escape since we had lots of gems we hadn't had a chance to get rid of. Needless to say, neither of us got even close to rolling four keys between us before time ran out. Once they finished up Seasons, Matt decided to teach Zane and I how to play Robinson Crusoe while everyone else played Agents of SMERSH. Unfortunately we only made it to round 5 before the play area was closed for the night, but we were set up pretty nicely to win having only had a couple of fails and drawing a couple of cards. Saturday I showed up and Matt and his friends were only a couple rounds into Pit so I jumped in. I got so close to cornering the market a couple of times but couldn't quite get it. Thankfully I wasn't getting stuck with the bear or the bull for awhile and was doing decent by not having a negative score. Unfortunately I started to ruin that. Thankfully I finally cornered a market worth 100 points and was able to end the game with a positive score, putting me in fourth place out of six. This was my first time playing Pit and I loooved it. I love simple, frantic games that can play a lot of people so it was right up my alley. I had recently picked up this game and have been very anxious to table it. Matt and Ben had played it before so they taught the rest of us how to play and we settled in for a 6p game. Winter tiles I was dealt were an extra VP for gold and vp for each set of tools. I managed to win the gold mine, but got distracted and didn't utilize it as much as I could have. I tried for sets of tools but the ones I needed were always on bad ships and I had no luck with the random draw. They ended up giving me right around the same amount of points, but I only put in the gold tile because I thought other people might have had enough tools to contend me for it and only one other person really even had gold (and they barely had any). I ended up getting the gold tile, but that was it for winter tiles. Got a turn order one and a decent ship and ended up coming in third (first and second were really close and there was a margin between them and me). All in all, I was very happy with the game. The dynamic number and type of meeples along with the bidding makes for a really cool experience. I haven't even touched the tip of the iceberg yet. 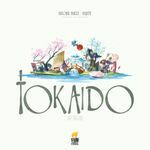 Tokaido was a recent acquisition for me and Matt wanted to learn so I sat down with him and his friends Ryan and Kyle for my first game with enough players to be able to use the double spaces. Matt rode our coattails pretty much the entire game, spending most of his time on double spaces and mopping up tons of things. He either got or shared every end game achievement at the end... Needless to say, he won. After Tokaido, Zane joined us and we decided to play a 5p game of Hanabi. Ryan and Zane hadn't ever played before so it was kind of a trial by fire for them. Rather early on Zane discarded a red one he knew he could play as we were low on clues and there were two other ones in the deck. Of course, those other two red ones ended up being two of the three very last cards drawn. Aside from that mishap, we did as perfectly as we could and ended up getting to five on every other pile for a score of 21. Not too shabby! We were waiting for Matt's friend Jason to finish up at an event he had so we could grab dinner so we continued on with filler games. I need little excuse to bust out my favorite filler game so I taught it to everyone but Matt who had played it once before with me. We ended up playing three games. The first game there were no cores left at the end of the game. I barely edged out Zane's 9 points with my 10. Kyle was the only other person in the positive with 7 points and Ryan ended with -2 while Matt got -42. Second game was a bit more even and had one core left. I won again with 9 points. Matt got 2 this time, Zane got 1, and Ryan and Kyle came in at -7 and -10 respectively. Third game and it turns out Zane was too hungry for fine muscle control. He took every single core but one which Ryan got (Matt and Kyle had dropped out of the game). I edged Ryan out by one point with my 11 to his 10 and Zane's score was so bad we didn't even do the math. Given that everyone was getting too hungry for Bling Bling, we needed something else that was really short and a bit more mindless so we settled on Love Letter. We played a number of rounds super casually with players subbing in and out as people ran back to their hotel room or the bathroom. We probably played about two entire games worth when Jason finally finished up his event. 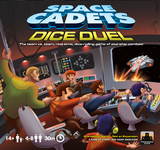 I have been dying to table Dice Duel since I picked it up at GenCon but haven't been able to gather enough people at my regular game night to play it (as I wanted at least six). Given that we had exactly six in our group, I made sure that we played this when we got back from dinner. We had some minor rule hiccoughs cause the rulebook was a little vague in areas and it took a bit of explaining before everyone fully understood how their stations and firing torpedoes worked. We settled on Matt and I playing opposing Engineers with Jason and Ryan on my team and Zane and Kyle on Matt's. First game was close but they ended up tractoring us into a mine for the win. Everyone immediately wanted to play another. We kept the same teams but Jason and Ryan switched stations on my side. We were both at three damage and somehow my ship had managed to have a mine right in front of us meaning that we couldn't move at all. They were at our side so we couldn't fire a missile at them either. Our only hope was to tractor them into the mine in front of us before they shot us. We frantically rolled lightning bolts and were able to get enough to tractor them! It was at this point when we tried to tractor them into the mine that we realized that we had misinterpreted the rulebook; it said you move the spaceship to an adjacent space which we had thought meant a space adjacent to the ship doing the tractoring. They protested that this was unfair and we agreed that it did seem OP and that the rulebook must have meant you only get to move the ship one space adjacent to where they had been... but we hadn't been playing by that rule up to this point and the last game their killing blow had been done by tractoring us adjacent to them.. so we called the two games a draw overall. Holy crap, this game was a lot of fun, though! It drew a lot of attention and interest from onlookers too. I'm really hoping to get to play it some more soon. After that frantic bit of craziness, we decided we needed something more laid back that everyone was familiar with; thus, Shadow Hunters! We had a 6p game and I drew Allie, one of my least favorite neutrals. I ended up taking a lot of damage and had to use my power to heal as someone insisted on hitting me. Thankfully everyone pretty much left me alone after that (which didn't make for the most exciting game from my end). Matt ended up being the other neutral, Charles, that needed to kill someone after three other people had died. Unfortunately for him, he didn't get a shot at that as I think Shadows Ryan and Jason managed to take out both Hunters Kyle and Zane with both of them still alive. Shadows and I won! Second game and someone at the con named Xander joined us. I drew Shadow this time. Couldn't get a green card for the longest time so I spent most of the game not knowing who my partner was. I did get one finally and gave it to Ryan on my right to find out that he was a neutral. He gave me a hermit card and found out that I was a Shadow and we had a sort of truce for awhile until he decided out of nowhere to attack me! I wasn't entirely sure why he decided to do so, but since he drew first blood I was then inclined to take him out of the game completely. He was getting really high in damage when I paused for a moment, let the blood lust fade a bit, and thought about why he might turn on me as a neutral. I then had a sneaking suspicion that he might have been Catherine (neutral that wants to die first) and had gotten exactly what he had wanted by attacking me (angering me to the point of killing him). Somewhere along the way one hunter had died, so at this point my Shadow buddy (who ended up being Xander) and I were sitting in a good spot as we could kill either of the remaining two people to win the game. I believe that we ended up killing the other Hunter for the win. At the end it was revealed that Ryan was indeed Catherine and had attacked me hoping that I would hold a grudge and kill him in return! Thankfully I had my moment of insight as he had been two points of damage away from death and would have surely died with his next blow or could have suicided using the Weird Woods. Close, but not quite enough, haha. Zane, Matt, and I decided to end the night with another shot at actually getting to complete the first scenario of Robinson Crusoe. Xander joined us for a full 4p game. I drew Carpenter and utilized my power to build for one less wood a bunch of times. It took us awhile to build any sort of shelter so we took a lot of damage in the beginning, though we did manage to do a ton of exploring. Zane was our Explorer and he must have been drunk the entire time as he managed to succeed every explore but always took a wound and had to draw a card (I think he had one roll the entire game that didn't end with him taking a wound and drawing a card). Of course, this meant Zane got very low on health towards the end of the game and was likely to explode at any second as he had a number of cards in the deck that specifically tied back to him. Him and Xander (our Soldier) were both really low on health the turn we built the bed. All we needed was to survive the Encounter phase without Zane blowing up. Thankfully we managed and they spent their entire next turn resting up in the bed so they wouldn't die. We ended up winning on turn 10 by a margin so small that had we drawn the wrong Encounter card or had needed one more turn, we probably wouldn't have won the game. It was awesome. When I showed up Sunday, Matt and his friends were just finishing up a game of Lords of Waterdeep with Scoundrels expansion. Ryan and Kyle wanted to run and grab some food, so we needed some quick games that Jason, Matt, and I could play. 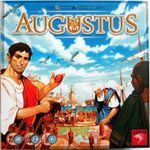 I've been hooked on Augustus which is quick and easy to teach and play so I taught them and we banged out a game. This game marks the first time I've seen someone get the orange objective. I built four orange and had the one that gave me 6 points/per orange along with one that game me 4 vp/dagger of which I think I got the max value for. I won with 80 points. Matt wanted to play Tokaido again so we taught Jason and played a game while we were waiting for Ryan and Kyle to be ready to play a game. This time we didn't have enough people to use the double spaces so Matt couldn't ride everyone else's coattails to victory. I think he did the worst by far with my winning and Jason not being too far behind. Ryan and Kyle finished up eating and joined us for a 5p game of The Speicherstadt. This marks the first game in which I didn't net negative points from the fire! (I think I ended up with zero.) I found myself targeted too much to win, but did manage to come in second to Kyle with my Warehouse and some contracts completed. Our friend Noah showed up and joined us for a 6p game of Shadow Hunters using these cards I had printed off of BGG. I was a Hunter and found my partner when Shadow Noah revealed so Matt would get hurt if he rolled in the same area which made Matt reveal as he was Evan and now in love with Noah. Given that this meant Matt could either win with me via his normal win con or could win by killing me and the other Shadow, I wanted to kill Noah asap so he wasn't tempted to jump ship. We soon found out which neutral Jason was as he attacked Matt for 1 damage, then revealed that he was Belladonna so he could gain Matt's win con. We soon found the other neutral when Ryan revealed that he was Cassandra and gave Matt an equipment card so he would win when Matt won. Kyle revealed not long after as he was Unseen and, in doing so, he ensured that we couldn't attack him unless he was the only one in an area. His next step was to get Ryan on his side which he did soon as he had an equipment card at the start of his turn. I think Ryan ended up being the first one to die as we decided it was easier to kill him than it was to try and ensure he was on our team. I was also able to kill Noah, ensuring that Matt could only win with me. I think Jason was the next one to die. With so few people left alive, we were finally able to hit Kyle and were able to kill him, though he put up one hell of a fight. Hunters won along with Jason who died with Matt's win con. Unfortunately for Ryan, he had died with Kyle as the Chosen one so he lost. All in all it was quite a crazy game. I think everyone but me was revealed by the third round. With the neutral win cons being able to switch and Matt being in love with a Shadow it was very interactive and chaotic. I can't see myself playing with the roles too frequently, but I'll definitely play with them again when I want something a bit nuts. For the second game we played with this set of cards I had printed off and played before. I drew Aflac and was pretty promptly killed by the second round when I was hit by the first blood kit and attacked. I didn't get a chance to reveal and flip my win con to the right, so my win depended on Noah being alive at the end of the game. The other neutral ended up being the Chameleon, but we had decided his win needed to be the only Neutral alive) didn't supersede the Hunters or Shadows so he tried to stay out of the way with me dead.